Surgical interventions, such as removing a tumour or correcting a spine, are always tricky procedures. In some cases, they happen before we are born. What seemed impossible a few years back is now a reality, and more and more interventions happen while the baby is still in the womb. Last April a team at Philadelphia’s Children’s Hospital announced that they had successfully removed a tumour from a foetus’ heart at week 21, lowering its previous record which was at week 24 and, more importantly, allowing the mother to complete her pregnancy. More and more surgeries are done in utero, and even the pregnancy itself, for premature children, could soon be completed in an ‘artificial uterus’. Sometimes science goes so fast that new techniques and discoveries happen even before there is a patient to test them out. 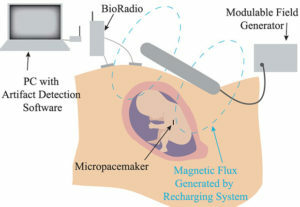 This is the case of the world’s first foetal pacemaker, developed by the University of Southern California, which is ready but still waiting for its first unborn patient. The device, a 3.8 millimetre long cylinder, will be used to treat foetuses affected by problems in the heart conducts, which lead to a slow beat. These problems start to have an impact on the baby’s development around week 28. In the US, about 500 children suffer from this kind of condition every year. Current pacemakers rely on long-lasting titanium, but this material, although great for adults, is too big to fit through such a small cannula. Luckily, researches came up with a solution: to replace the titanium with an epoxy case, which is much lighter and would fit perfectly the cylindrical device. After they are born, the children can have a normal pacemaker. The pacemaker has been successfully tested on sheep and obtained clearance for human use. Let’s hope it’s set and ready to beat soon! Read the full story in IEEE Spectrum. Illustration by: University of Southern California/IEEE.